The aim of this chapter is to analyze the worldwide diffusion of e-parliament and the role played by the Global Centre for ICT in Parliament (GCIP), within the framework of policy transfer. There are two main reasons why it is necessary to focus on the role of GCIP in the diffusion of e-parliament: 1) The GCIP is one of the most active actors in this process; and 2) Activities undertaken by the GCIP and its relations with its partners give important clues about the big picture of e-parliament transfer at the international level. In the analysis of worldwide diffusion process of e-parliament in this study, policy transfer literature is used. This chapter goes beyond the conceptual framework and case studies pave the way for the evaluation of e-parliament from a different perspective by focusing on the transfer of e-parliament as an innovation. Today, information and communication technologies (ICTs) have affected political and administrative areas in a profound way, and the extent of this impact increases day by day. Nowadays, ICTs are considered as a set of means which play an important role in the improvement of public service provisions and simplifying and integrating of administrative processes as well as involving of citizens in political and administrative decision-making processes and improving a country’s democracy. Online election campaigns undertaken by politicians, websites and blogs of those elected, e-voting, e-participation, e-democracy projects and the e-parliament phenomenon clearly show that ICTs are part of political issues, activities and institutions. Although e-parliament applications were put into practice later than e-government and e-democracy projects, efforts to increase the usage of ICT in parliament have been apparent at recent times. Such efforts are also supported by international organizations. In this context, the Inter-Parliamentary Union (IPU), the European Union (EU), the United Nations Development Programme (UNDP), the World Bank and the United States Agency for International Development (USAID) make great efforts to encourage parliaments to benefit from ICTs (Leston-Banderia, 2007, p. 656). 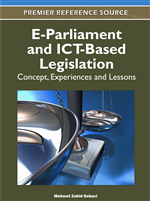 E-parliament application is becoming widespread thanks to its contributions to parliamentary activities, parliament-citizen relations and the institutionalization of democratic values and principles (Sobaci, 2010). This process can be easily understood by looking at indicators regarding national parliaments’ ownership of websites. IPU (2000, p. 3) reported that, as of the year 2000, only 57% of all national parliaments had websites. Six years later, the IPU reported that 171 of 188 national parliaments, which correspond to 91%, own a website (Leston-Banderia, 2007). According to the UNDP (2006, p. 15), while web site ownership ratio in developed countries is 97.22%, it is 81.05% in developing countries. There are studies on the usage of ICTs by parliaments and their political, administrative and social reflections in e-parliament literature, but there are few studies that explain how e-parliament practice has diffused worldwide and which factors and actors are influential and active in this diffusion process. In other words, theoretical and empirical studies that present the details of the diffusion process by which e-parliament practices have recently been adopted by countries in a wide geographic are not available. The aim of this chapter is to analyze the worldwide diffusion of e-parliament and the role played by the Global Centre for ICT in Parliament (GCIP) within the framework of policy transfer. There are two main reasons why it is necessary to focus on the role of the GCIP in the diffusion of e-parliament: 1) The GCIP is one of the most active actors in this process; and 2) Activities undertaken by the GCIP, and its relations with its partners, give important clues about the big picture of e-parliament transfer at the international level. In this study, to analyze the worldwide diffusion process of e-parliament, policy transfer literature is used. By focusing on the transfer of e-parliament as an innovation, this chapter goes beyond the conceptual framework and case studies and paves the way for evaluating e-parliament from a different perspective. In this context, first of all, the literature on adoption of ICT-based innovations is examined in relation to e-parliament. Then, the concept of policy transfer is explained. The reasons for transfer, its actors and subjects are presented in this section. Lastly, the role of the GCIP in the process of sharing information and experiences related to e-parliament is analyzed within the framework of policy transfer.